How do I find the tempo in my MMD 7.39 dance? How do I keep time to the music in MikuMiukDance 7.39? How do you use the metronome? My new “Dueling Banjos” project presents an extra challenge in that the tempo is constantly changing! I needed a way to find the beat. The “oscilloscope” view of my WAV file was almost useless because the guitar and banjo music creates a constant sharp chatter, often covering the entire spectrum and so obliterating a view of the beat. I filmed my old Grampa clapping to the music as an Mpeg using my nice ol’ Sony Mavica MVC-CD500 digital camera. I converted the Mpeg into an AVI file by opening it in NERO 7 and exporting to an AVI file. I then opened MMD, opened a NEW dance and set that AVI to run in the background. Finally, I animated my LearnMMD Metronome over the top of it. Luckily, I didn’t see any tempo loss or gain by going through all of these steps. The resulting animation and video still run true to my original WAV file. As I animated the Metronome, I corrected for Grampa’s errors and adjusted the metronome to better match the “scope” if I saw a difference. The resulting “beat” looks to be very close to “perfect” … so now I can move on with the project! 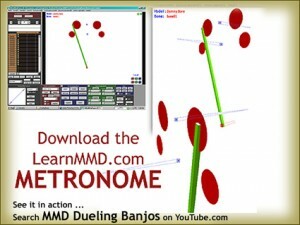 See my Dueling Banjo project on LearnMMD.com … check it out!